The Farmers Market @ ASU Tempe is holding a special anniversary recognition ceremony, Jan. 27, to honor the vendors, staff, students and community partners for turning a vision of socially embedded market tradition for ASU and the greater community into reality. The farmers market concept at ASU began as an environmental sustainability service learning class project. In September 2009, Chad Williams, former president of the ASU Health and Counseling Student Action Committee, collaborated with multiple ASU departments and university partners to organize a pilot market. Due to the overwhelming response of the pilot market, a monthly market started being held during the spring 2010 semester. Interest continued to rise, so during fall 2010 the market started being held every other week. Over the last five years, the market has provided fresh and local food for students, faculty, staff and the Tempe community while raising awareness about healthy eating and sustainability. In April 2012, the Farmers Market @ ASU Tempe received an ASU President’s Award for Sustainability. During spring 2015, the farmers market will be conducted on the Student Services Lawn from 9 a.m. to 2 p.m., on Jan. 27, Feb. 10, Feb. 24, March 24, April 7 and April 21. With approximately 25 vendors, the market features seasonal produce, specialty food items produced in Arizona and ready-to-eat food and beverages. While the event is geared toward ASU students, faculty and staff, the outside community is also encouraged to visit the market. The farmers market is a collaborative effort, sponsored by ASU departments, student groups and community organizations. “The market contains a wide variety of healthy foods. One can enjoy lunch, buy fruits and vegetables, or pick up a snack on the way to class. The farmers market provides us with opportunities to integrate healthy eating and green living practices into our daily lives,” says Betty Lombardo, manager in the Office of University Sustainability Practices. 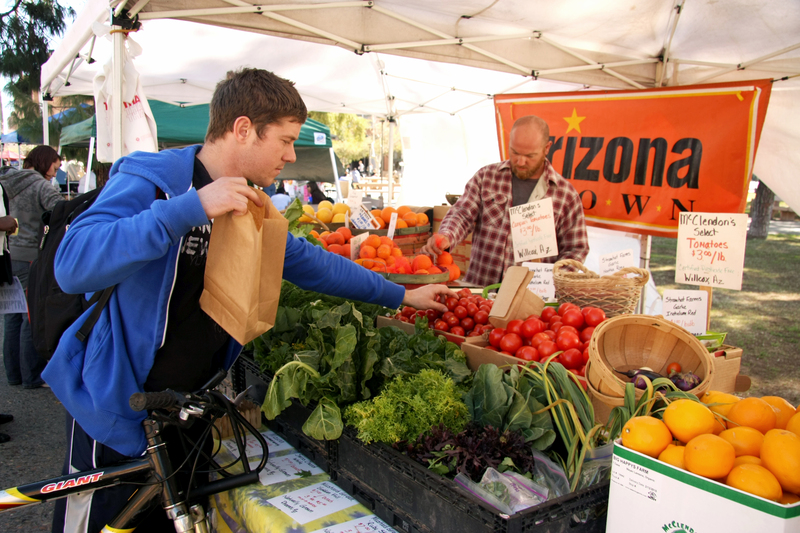 For more information about the Farmers Market @ ASU Tempe, visit asu.edu/farmersmarket. 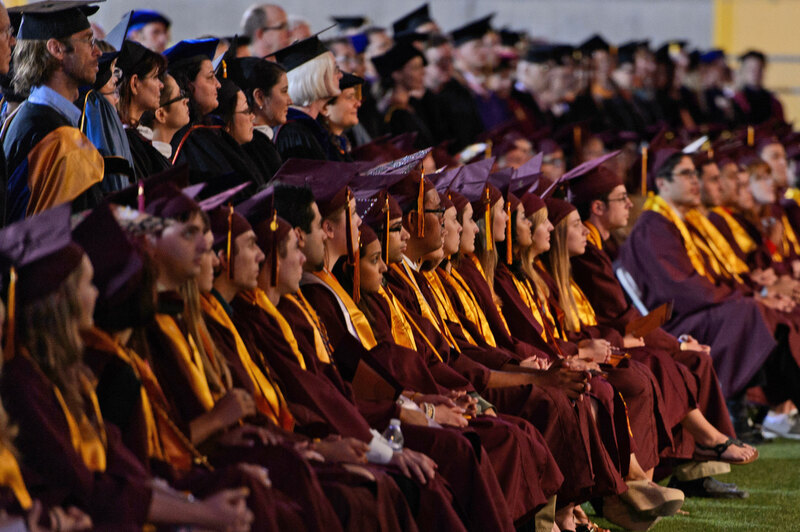 Arizona State University's four-year graduation rate has increased 20 percentage points since 2002, thanks to academic innovations such as eAdvisor and first semester seminars. Tatiana Jenkins first encountered eAdvisor, one of Arizona State University’s tools to help students succeed, before she even applied to college. Three years into her ASU career, Jenkins is now something of an eAdvisor super-user. She utilizes the tool, which prescribes a pathway to graduate in all of ASU’s 370 undergraduate majors, to guide her own education, and she works to assist younger students in staying the course as well. She counts herself as someone who has benefited from the eAdvisor system. Staying on track is key to a student’s success. The university’s four-year graduation rate has increased nearly 20 percentage points since 2002, with the largest increase starting in 2007, after eAdvisor was launched. That dramatic improvement is the result of ASU’s deep investment in integrating technology like eAdvisor into the learning experience, and experimenting with new ways to keep students on the path toward earning a degree. eAdvisor isn’t the only change the university has made to help students succeed. ASU instituted a first-year seminar course called ASU 101. Students learn time-management and academic integrity, but are also introduced to the values of the university, including its focus on sustainability and entrepreneurship. ASU 101 teaches all entering freshman best practices to be academically successful in college. The university also created residential communities in which students in individual schools live together. Administrators say this allows college staff, some of whom live in the halls themselves, to know where their students are, and help keep them on target if their grades start to slip. Deans at individual schools and colleges were also asked to become more responsible for their students’ academic outcomes. Each of these programs helped to increase academic success and contributed to the improvement in graduation rates. Even with the measurable success, ASU continues to do more to learn how to improve student outcomes. In the fall 2014 semester, Art Blakemore, senior vice provost, led a pilot program called Learn-Explore-Advance-Design (LEAD) to test an interdisciplinary approach to teaching three subject areas: communication; critical reading and writing; and academic success. One hundred students learned in a “flipped classroom,” where lectures and presentations were placed online, and in-class time was spent collaborating on projects related to the material. They also got more individualized attention from faculty. The students in LEAD were ones the university thought could benefit from a more hands-on approach during their first semester in college. Similar students who were not in the LEAD program tend to advance to the second semester of freshman year at a rate of roughly 85 percent. Students in the LEAD program advanced at a rate of 97 percent. “Now the question is, can we scale it?” Corey said, referring to a critical question at a university the size of ASU: How will something like the LEAD program work when it is applied to thousands of students instead of just a fraction of that? It is that kind of experimenting that has led to the success of programs like eAdvisor, which not only describes courses and majors, but allows students to see exactly what courses they need to take, what semester they need to take them in and what grades they need to get to stay in the major. For Jenkins, the political science junior, that kind of innovation brings a school the size of ASU within reach.